At least the Dogs won! Here I am, wrapping up a downright awful day typing away doing this blog post with a bag of frozen mixed veggies on my foot....Actually, it's a great day now that the Dogs and Frank (the big) Slubowski earned a 4-2 win over the visiting Prince George Spruce Kings. Speaking of goalies, former Dog Kevin Genoe make a couple of great saves early to keep the game scoreless and played a solid game throughout, but his teammates couldn't find the big goal needed to make a game of it after the Dogs capitalized on two power plays in the second to take a 3-0 lead. 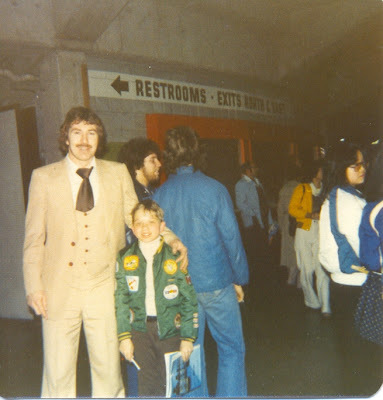 Back to Slubowski- I saw Frankie after the game and he had a smile bright enough to light up Port Alberni. He was beaming ear to ear- understandably so, as he just picked up his first Junior A win, in his home ice debut, and he also had the final curtain call infront of the Pound faithful with the 1st star announcement. And of course the crowd gave him one heck of a roar. Frank will sleep well tonight I'm sure. Great game for a great kid. Oh right, the back of frozen mixed veggies and the bad day..The day was bad of course after my Microsoft Office 2007 problem documented below. The day got even WORSE when I was getting ready to head to the rink before 5pm and I stubbed my toe BIG TIME. The official diagnosis from Bulldog Trainer Jess Moser was "big baby" She's probably right, but it's still killing me! Just imagining what the players go through pain wise over the course of a season makes this not seem so bad. One thing you NEVER thought you'd see on the blog. A picture of my toe. In the end, a message to the team should say it all- Thanks for making my day fellas! I love and hate computers! Today was the day that my 90 day trail for Microsoft 2007 expired on my laptop. This is quite the important machine as I do pretty much everything with it- the Bulldog game broadcasts, the "Bulldogs This Week" talk show, the the Previews and Recaps for the Dogs site. And of course, this machine is how I do everything for this blog! So I'm a little set back today and a little ticked off at Microsoft. Good ole Bill Gates! No warning, no anything, I have about 10 different files open and BOOM "your trial period is done you must now purchase Office 2007" How much do you think they want for office 2007? 400.00!!!!!! Yikes! I think I'm in the wrong business. So it's going to be a nuts game to do everything different for the game tonight. Sorry no picture for the blog today- the cheat sheet- another microsoft office thing. As much as I want to do all I can for the blog, I'm certainly not spending money on it! I spend enough darn time for nothing already! So that's my rant today. Sorry. Off to find Office 2007 I guess. Incredible that we don't realize how much we depend on these machines until they don't work anymore! The Dogs host the Prince George Spruce Kings tonight, 2-1 winners last night in Duncan. The Dogs won the only meeting between these teams back on October 10th, a 5-2 win in PG. Kevin Genoe makes his return to the Pound tonight and I would be surprised if he didn't get the start. But stranger things have happened. Pregame show tonight is at 6:45 and the puck drop is at 7:00. VOTE RODDY! | Tommy T snipes a G! Stick with me for a second on this one please, dear readers. I need a favour, if you could spare just 10 seconds of your time. I need you to VOTE FOR ROD PEDERSEN in the "Canada's Best Sports Blog" contest, since I didn't make the running (LOL). I first contacted Rod in the summer to talk about blogging and broadcasting, after former Bulldog and Regina Pat Isaac Smeltzer labelled him as "one of the top beauties of all time" The billing from Smeltz was on the money as we have talked several times since. I have brought Rod's blog up before on here and I have linked to it before for a variety of tidbits that I thought my readers might have found interesting. For those that missed it before, here's a breakdown on what his blog is about and who Rod is. I have actually been meaning to post something about the "Canada's Best Sports Blog" thing for a week or so, but I forgot. When I saw that Rod's blog was the ONLY blog outside of Ontario to get to the top 5, I was more than a LITTLE fired up. I read a handful of WHL and Junior A blogs from broadcasters and media types regularly and in my humble opinion every single one of them is more interesting than the other four nominees. When I saw today that one of the other final 5 bloggers in Ontario was throwing shots at Rod (incredibly, shots for being everything a blog SHOULD BE) I got downright steamed. SO. Vote Rod. Here's why, and here's how. Polls close tonight at 12:00am ET for voting for Canada's Best Sports Blog. As you know, this blog is among five finalists but one of the other blogs, a joker in Ottawa, has started an attack campaign against me. He labelled this (Rod's blog) blog as "low-budget" and "rough-around-the-edges", and nothing more than football gossip. While some of that may be true, I don't have the resources he does (Canwest and David Asper). In fact, my resources are .... mine. And that's pretty meagre. Actually it's limited to my computer and my digital camera. Still 1,400 readers find their way here every day, and nearly 500,000 have visited since March of 2006. Unfortunately for him, that Ottawa reporter has attacked an American political news junkie. Do you know what the #1 most prevalent trait is amongst politicians who launch smear and attack campaigns? Let's bury this guy. The voting link is below. As I said earlier, the guy attacked Rod for being what a blog SHOULD be. At least how I think a blog should be- low budget, individual, unique, and rough around the edges. Maybe it's just me, but blogs are supposed to be the alternative to the high budget and professional and mainstream stuff. So, please spend 10 seconds and vote for Rod if you are FOR blogs that are done for little more than a desire to get some words out there and get some promotion out there for the individual and the teams that they cover. Don't get me wrong, I'm all for the big media corporations, I work for one afterall, but I'm not for them being bloggers. Count a vote for Rod as a vote for me and how I run this thing, if that helps to sway you into spending 10 seconds. Just plain vote for a blog that exists outside of the CENTER OF THE UNIVERSE in Ontario. I know the folks in BC will certainly be all over THAT point! Here is the voting link- click and vote for PEDERSEN MEDIA, please and thanks. Last but certainly not least- NO, I haven't been put up to this by Rod or anyone else. People should know by now that I don't really work that way. I chose to post this because Rod has been a good guy and a help to me, and for the fact that the country does indeed exsist West of Toronto. Here's to the thought that all the blogs there will split the vote amongst themselves HAHA! Quite the story last night in Powell River, where Surrey Eagles goaltender Tommy Tartaglione SCORED A GOAL. No, we aren't talking about a delayed penalty goalie pulled and the puck last hit Tartaglione before the Kings scored on themselves....We are talking about Tartaglione dropping the puck beside his goal and SHOOTING AND SCORING, ripping one down the ice into the Powell River net with 29 seconds to play. I saw the video this morning, what a beauty. It's all a big coincidence I know, but Surrey has now had a couple of odd incidents regarding goaltenders. Who remember 2004-2005 when the Eagles lost BOTH goalies (Dustin Slade and Aaron McKenzie) to injury in the same game and one of their defensemen donned the gear and came in for the third period and PUT UP A SHUT OUT? If memory serves me right it was Stewart Thiessen. I remember having him on our "Bulldogs This Week" talk show the following night and it was a great story. That's like Atom A stuff, throwing on the pads for a period. So congrats to Tommy for the unique feat of finding the net as a tendy. I came close once or twice....but no twine ticklers for me. Great news. This is what it's all about kids. The Bulldogs announced this morning that Daniel Moriarty will attend Harvard. Read the PRESS RELEASE ON THE BULLDOGS WEBSITE. SNOW!!! | Mutual Respect- visiting players to the fans. Moving on now to the mutual respect that has obviously built from the visiting players to the hockey fans at the Pound. I say HOCKEY FANS because it's obvious that those attending the Bulldogs games at the Pound are HOCKEY FANS first, and BULLDOGS FANS second. For the most part at least. I'm sure there are some that come just because it's the Bulldogs and HATE the opposition and let them have it all night. They are in the big time minority though. Sure, if you are a visiting player and you cheap shot someone or disrespect the game or disrespect the fans they won't like you and they will let you know about it. I say "the mutual respect that has obviously built" just going on the number of visiting players that stick around at the end of the game and come out on the ice to salute and thank the fans when they are announced as a star. Why does this happen? My theory- while it is a pretty big league, the GAME is very small. Word spreads fast among the players. Good and bad. It spreads just as fast or even faster through coaches and GM's. So I'm guessing that one guy said to another guy "how about the fans in Alberni, they even cheer the OTHER TEAM for the three stars" And the trickle effect started. More and more guys started coming out for their stars, and now it's more guys than ever. And it's really nice to see the "mutual respect" thing back to the beginning of this all. The fans respect the players and appreciate their efforts in entertaining them and playing in the league and being awarded a game star. The best thing about the fans applauding the players is that there is no limit to what the fans will do. Meaning- they don't care if it's a player from the most hated rival of the Dogs, ie- The Nanaimo Clippers- they will still give the player a cheer. Please don't misconstrue this as a shot to other teams and their fans. It isn't. As far as I know and as far as I've seen every building is the same- boo the other guys, cheer our guys. And there's nothing wrong with that really. It's just the mentality of the game and the atmoshpere in most rinks. The Pound is not most rinks. And the players from OTHER TEAMS are proving it. So please, post this on the good ole message board (I'd hazard a guess that 99.9% of all BCHL players read it) to get the word out to any visitors that don't already know- If you get awarded a game star in Alberni, hang around and come out. The crowd here will give you a cheer. No kidding. EDMONTON - Daryl Katz's quest to buy the Edmonton Oilers has suddenly become much easier with the collapse of a potential bid from within the team's board of directors. The small group of non-Katz members within the Edmonton Investors Group have notified the 34 group members that there is no counter bid that can match or exceed the local billionaire's offer. At the moment, it appears Katz has secured at least 60 per cent of the group's 7,492 shares. While he could close the deal with that amount, a source indicates he would ideally like close to 80 per cent. Katz has now imposed a Feb. 5 deadline to officially close the deal. 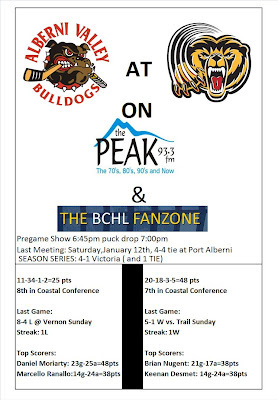 "Bulldogs This Week" is live on your radio and the BCHL Fanzone (sign in, click on"weekly shows" then "Port Alberni") and live on location at Alberni Chrysler tonight from 6 to 7pm. Click the image below to enlarge the guest list. Don't by SHY- send those questions in for me or any of my guests by CLICKING HERE or stop by Alberni Chrysler tonight to catch the show live in person. 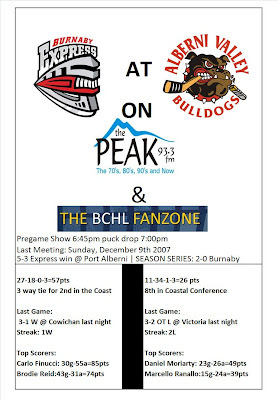 Coming off a 3-2 OT loss in Victoria last night, the Dogs host the Burnaby Express tonight. Click the image below to enlarge the cheat sheet. 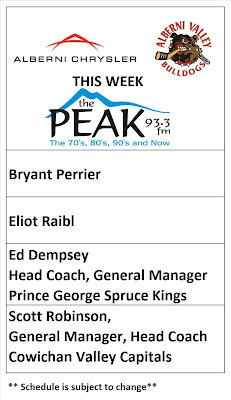 Tonight's second intermission feature guest is Ron Gallo, the play-by-play voice of the Prince George Spruce Kings, who visit the Pound next Thursday. Courtnall on Ross. I reviewed the video of the Justin Courtnall hit on Kevin Ross on the bus last night. For those that missed it, Courtnall caught Ross coming out of the Dogs end with 1:06 left in regulation and knocked him out cold. Josh Pineiro took exception to the hit and dropped his gloves and went after Courtnall. Credit to Courtnall, at least he knows the CODE, so to speak. You knock a guy out, someone will most likely come after you. It's just the way the game goes. Anyway....Courtnall dropped his gloves and had a scuffle with Pineiro. He threw punches just like Pineiro did. I hesitate to call it a FIGHT because it wasn't much of one. By the letter of the RULE BOOK it was one though. In the end, the game night referee somehowwas oblivious to this happening, or he wanted to put the boots to the Dogs intentionally. Either way it's bad. Josh Pineiro gets 2 for instigating (deserved), and five for fighting. Courtnall just gets 2 for roughing. And absolute joke. Cue overtime, where Courtnall gets the game winner. Refereeing deciding the outcome of the game, exhibit A. Anyway, that's just the facts. The Courtnall hit was CLEAN. He did not leave his feet, he did not take more than three strides. Ross was shielded from seeing Courtnall coming at him by another Victoria player that had him screened. Shane Power from Lasting Images Photography sent me a picture of the millisecond before the hit. Feet planted, elbow down. Thanks for the picture Shane. Although a still image isn't able to show that Courtnall did not CHARGE the player to make the hit, you'll have to trust me when I say that I looked at the video, and he didn't. Anyone that has listened to me and has watched enough games know I tell it like I see it. When the officials call things the opposite of how things happen, that's when I get in trouble. I've always said it- If I sound bad for telling the truth, and I the one at fault? UH......NO. One thing about the hit- contact to the head was certainly made. Feel free to call me old school on this, but I don't understand how a player is to blame for hitting another player if the player has their head down. What are you supposed to do? I'm all for eliminating HIGH HITS - meanin deliberate attempts to go after the head. What I am NOT FOR is taking hitting out of the game and punishing another player for catching an opponent with his head down. I have asked Shane if he has a picture of both players FIGHTING, GLOVES OFF, after the hit. I hope he does. Edit- Hmm. I was hoping for an action shot of punches being thrown. This one is good enough. Gloves off. I love this league....but I'm like every other fan in that I hate the same (DELETE DELETE DELETE) officiating almost every other night, or so it seems. Not just against my team either folks. Frank Slubowski, that's who. As in the Bulldogs starting goalie tonight. I'm a little surprised that Frank gets the start tonight, but I guess the coaching staff wants to see what he's capable of as the Dogs are in a nothing to lose position. Good luck Frank! If you manage to tune in to the broadcast tonight, Frank will be my first intermission guest. Settle down, not THAT kind of love. The "this guy is the biggest beauty in the league" kind of love. My favorite part- "I'm not sure which part of it I'm not saying in English"
TORONTO - Scratch Brian Burke's name from the list of candidates for the general manager's job with the Toronto Maple Leafs - for now, anyway. At the Hockey Hall of Fame on Friday with Anaheim Ducks owners Henry and Susan Samueli, who donated a 2007 Stanley Cup ring to the hockey shrine, Burke stated emphatically that he and his wife are happy in California and has no interest in applying for the Leafs' job that Cliff Fletcher was hired to fill on an interim basis upon the firing of John Ferguson on Tuesday. `I have no intention of going anywhere else,' said Burke. `I've said this repeatedly to anyone who will listen. Burke is on a four-year contract through 2008-2009 and he said he expects an extension can be negotiated this summer. Samueli, so happy with Burke's work, said Burke can have the job for life if he so desires. `I'm flattered by all this,' he said of conjecture he might want to move back to Canada and join the Leafs. `It's a great job. 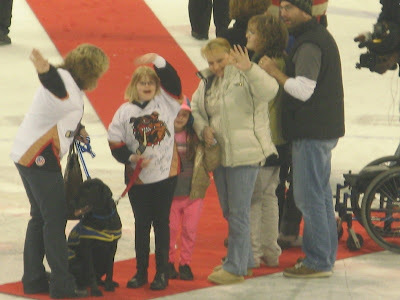 Dogs visit Grizzlies, League posts All-Star Game Video, Remembering Don Wittman. First things first. The Dogs return to action tonight in Victoria against the Grizzlies. Click the image below to enlarge the cheat sheet. 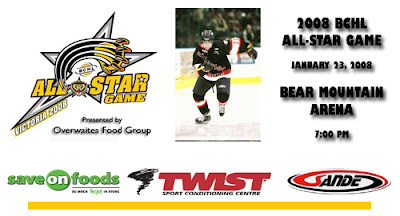 This sounds cool- The BCHL has made the video of the All-Star game available in the fanzone. Click HERE for more info. Get yourself signed up for the fanzone too! I haven't said much about the passing the legendary Don Wittman as the news broke when we were on the road last weekend. What can really be said about Don? All I have heard is that he was 100% class and my limited experience with him can attest to that fact. Dan "the stats man" sent me an article from a Winnipeg paper that broke the story of Don battling cancer. At the bottom of the story Don's email address was provided for those that wanted to send along well wishes. I just couldn't resist sending Don a note. Not just a "get well and keep fighting" note, but a note to let him know how much of an inspiration he was to me (and I'm sure countless others) to get into the play-by-play/broadcasting business. Some of Don's calls were the background noise to my growing up. Actually, everything else was probably the background, CBC Sports was the focus, HAHA. Being a Manitoban and following the Winnipeg Jets I heard alot of Don. I'm sure you were in the right place at the right time Mr. Wittman, but I think that you are certainly in the right place now. Rest in peace. Some of Don's best calls. This one is my favorite. The ROAR from the Winnipeg Arena crowd in this clip is something I have only heard in two other places- The Dog Pound in Port Alberni, and the GLMC in OCN. It's indescribable. Nuck fans will never forget this one. Coast beats Interior, A couple of great pictures, RHM SUBS. OK, this might get me in trouble. My apologies in advance Mr. John Grisdale. But my good buddy Jamie Amos has requested that I add a couple of pictures to the blog. Sorry! 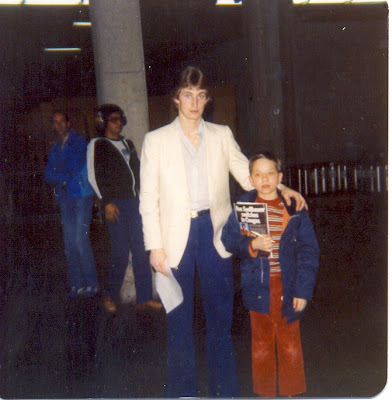 Without further delay- I give you John Grisdale and Jamie Amos from April 1979 when John played for the Canucks. Jamie was 11. HEY, don't laugh- If I got a picture of YOU from 1979 you might not find it funny. Lookin' sharp fellas. If you are looking for a good meal at a good price I would like to suggest RHM Subs n'more on Redford Street across from West Coast Floors. I have wanted to get in there for a while and I just finally managed it on Tuesday. One word- OUTSTANDING. -It was nice to see the 'Nucks win last night. They were hungry and desperate and it showed. -I might go crazy if I see Taylor Pyatt walk in and clang another one off the glass in the shoot out. Maybe it's just me, but it seems like I've seen Pyatt miss the net FIVE TIMES in the shootout the exact same way he did last night. I'm all for picking your spot, of course I know it's not easy, but fer goodness sakes if it doesn't work a couple of times at LEAST HIT THE NET and make the tendy do something. -The BCHL video broadcasting still needs some work. I appreciate the effort, but the result last night was more than disappointing. Maybe it was just my connection or my computer (there are a tonne of variables) but I would get two seconds of continuous video AT THE MOST. What a pain! I liken it to being a 50 goal scorer on a 20 game goal drought who has been banished to the pits of hell to shoot two footers at a wide open net but JUST misses for ALL ETERNITY! Ok maybe it wasn't that serious but it was frustratingly impossible to watch. That's it for today. Back at it tomorrow as the Dogs visit the Grizzles at Bear Mountain. All Star Game tonight. Saturday night festivities. The BCHL All Star game goes tonight at the Bear Mountain Arena in Victoria, with Daniel Moriarty representing the Bulldogs in the game. Tune in to the Internet Broadcast through the BCHL Fanzone or through the radio broadcast from our sister station 106.9 The Wolf in Nanaimo. Dan Marshall has the call. I'm not sure who else is making their way down from the Wolf Crew. My thanks to Dan for giving me the chance to be a part of the broadcast tonight. I regretfully declined as I have enough on my plate right now, and I wasn't too excited about getting down to Victoria today and getting back tonight for a 6am Morning show tomorrow. 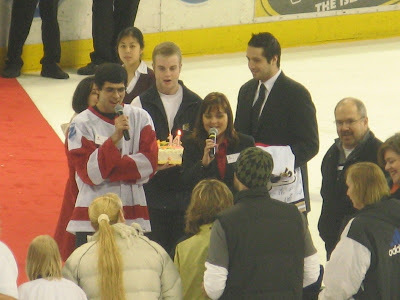 The ECHL's Victoria Salmon Kings had a fundraiser for Variety over the weekend, and Angel Magnussen and some of her friends were invited down to the game. 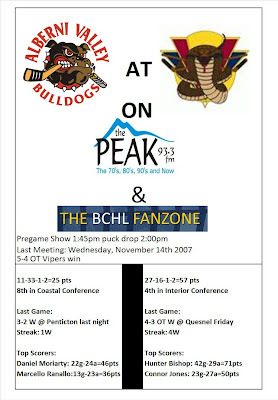 They said they liked the BCHL and Bulldogs brand of hockey better. 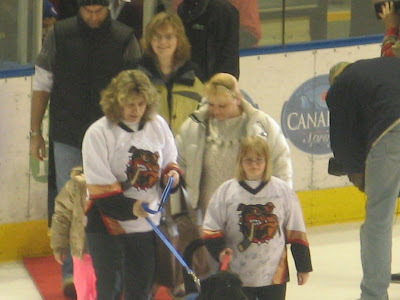 What I liked was how Angel and her Mom were flying the Bulldogs jerseys! Looking good ladies! We just need a jersey for Jelly Bean the service Dog! Wave to dad. Nice camera work dad! 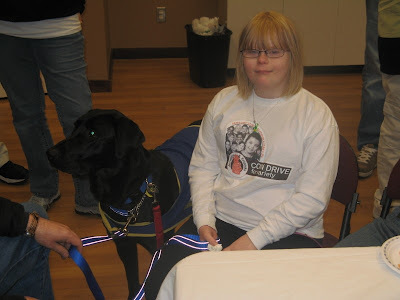 Angel and Jelly Bean, her service dog. Variety will have a table set up at the next Bulldogs game Saturday night, so please bring your spare change for the Variety Coin Drive. Don't be shy, have some fun! One more- Don't forget that Saturday night's game night sponsor is Alberni Chrysler- AND - they are giving away at the end of the game another trip for two to Las Vegas! Anyone 21 and over can enter. I intend to win this one myself! 6 days, 4 games, and 1872 kilometers later we arrived home at the Multiplex yesterday afternoon after a gruelling Interior swing where the Dogs went 1 and 4. Please forgive me for the lack of a blog posting yesterday. Wasn't up to it at all. I'm right back to the morning show this morning, and right back to "Bulldogs this week" tonight live on location at Alberni Chrysler at the "top of the town" from 6 to 7pm. Here's the guest list for tonight, click the image to enlarge. We'll talk with everyone about the All-Star festivities in Victoria tonight and tomorrow when the actual game is played. Of course with the Dogs in Victoria Friday and home to Burnaby Saturday we'll take about the things going on with the Grizzlies and Express as well. The fact that the Bulldogs are now mathematically out of the playoffs is something that I will also bring up. It's safe to say that the writing has been more than just "on the wall" for the team's playoff chances for a while now. With 20 games left and down 20 points I was thinking that a 20 game winning streak to end the season might not have even been enough to see the team in post season play. Of course I wish the team was in the playoffs and in the race, that should go without saying, but I'm almost glad now that they are mathematically out of it now so the focus can simply shift to what they were really doing all along anyway- getting better and competing hard every night to put the team in a better situation to win next year. I don't think that being in a "highly unlikely situation to make the playoffs" was a very good one. In a decade of doing this work, I have never broadcasted a team that didn't make the playoffs before. For that I know I am extremely lucky. This has been a big learning experience for me as it has been for the team. As I haven't worked with a team in the "spoiler" role before, now my attitude is that I hope to learn all I can from a new experience. Don't forget those questions in to me for the show tonight HERE I'll do my best to get them on the air. Exterior view of the Vernon Multiplex Nic Sandor and Adam Hout pilfer the "best seats in the house"
Pressbox views- left/centre/right some of the best in the league here in Vernon. A trainers job is never done. Jess Moser repairing name bars on the way to Vernon. Is there anything Krazy Glue can't do!? One more to go as the Dogs visit Vernon this afternoon to end the long road. Except the travelling home part of course! I am going to try to talk to Isaac Smeltzer today as my second intermission guest along with Evan Michalchuk. The benches, just below me. I had to take some pictures of the BC Hockey Hall of fame. First off Mr. Bernie Pascall. Be sure to read the bio to see where Bernie got his start- CFAR590 in Flin Flon, Manitoba. My hometown, and the same place I got my start in radio. CFAR still broadcasts to this day. Of course I had to get Mr. Jim Robson on the blog. 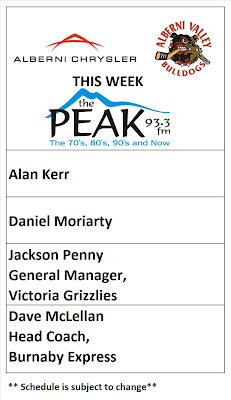 Former voice of CJAV AM- now operating as CJAV FM 93.3 THE PEAK. This is where is gets really wierd. I already have the Bernie Pascall connection, now the Jim Robson connection. What is particularly odd about the Jim Robson connection is that he and I both started at CJAV on the EXACT SAME DAY- 50 years apart. Lastly, the conceptual image of the new rink. Where's the pressbox!? Backs drop Dogs, Dogs visit Vees. Another tough loss for the Dogs last night in Salmon Arm, as they went down to defeat to the Silverbacks by a score of 6 to 3. The Dogs were up 1-0 early in the game, and then down 2-1 shortly afterwards. They would battle back before the first was out to make it 3-2 after one. The only goal of the second came on a Salmon Arm power play as they led 4-2 after two. The Dogs came out fighting in the third and made a game of it, making it 4-3 seven minutes into the final period. Then referee Chris Hartley put the boots to them, putting them down a man for four minutes, and in the middle of that down another man for a full two minutes. The Dogs didn't give up though, they killed off the full two minute 5 on 3. They couldn't get back on the offense though as Salmon Arm had all the momentum scoring to make it a 5-3 game and then a 6-3 just just a minute later. I've already said too much about the penalties....I have now deleted 5 different lines about it. I'm sorry, I'm not going to just ignore it when it's so obviously biased against one team. I'd do the same if it was the other way against the other team. It was a joke. Call me on it if you like. I'll see if I can get some video together to provide some proof. Some people from the Salmon Arm side of the puck in the booth spent a few minutes after the game talking with me about it, agreeing with me 100% on my descriptions. Is that when you know it's REALLY bad? Y-E-S. 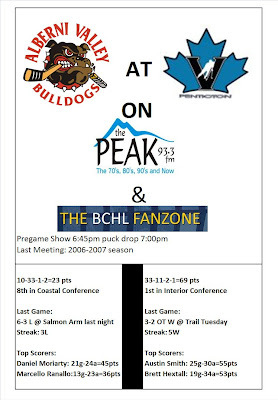 The Dogs have now lost three in a row and are win less in four as they visit the Interior and overall BCHL leading Penticton Vees tonight. Click the image below to enlarge the cheat sheet. Tonight's second intermission feature guest will be Todd Miller, the play-by-play voice of the Vernon Vipers who the Dogs visit tomorrow. 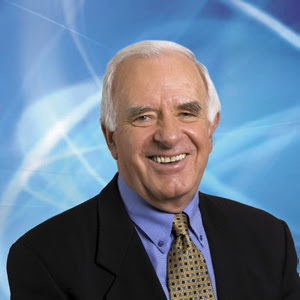 I will be joined by a special guest on the broadcast tonight, world renowned Sports Psychologist Dr. Saul. L. Miller who has worked with everyone in the sporting world from the NHL to the NFL to the Alberni Valley Bulldogs. This should be very interesting I'd think to the listeners.